Join Oriflame Today ! : Oriflame Earnings – how much do you want to earn? Oriflame Earnings – how much do you want to earn? Most people join Oriflame to earn money. I thought it would be useful to create a quick Oriflame Earnings table. This means that you are able to plan your own Oriflame earnings by quickly looking at the table. 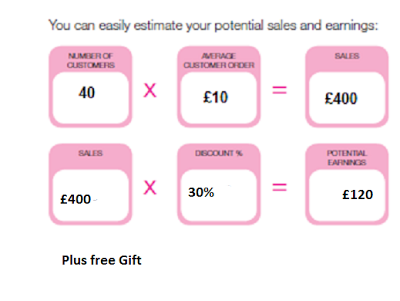 Remember these earnings are CASH earnings as you keep the Oriflame discount earnings from what your customers have paid you after you have paid Oriflame. Simply look down the right hand column to work out what you want to earn – and work across to find out how many ordering customers you need. If you want to increase your earnings, simply find more customers. Also, if you want to increase your earnings, why not look at becoming a Oriflame Manager .This is just finding and showing others how to earn money by being an Oriflame Consultant in your team. The average customer spend is £10 – this is my personal average and other people’s averages will vary. 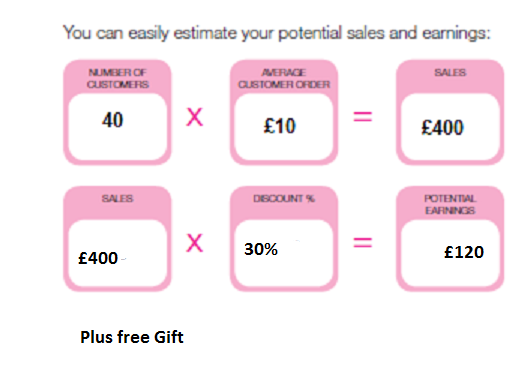 Commission levels are – 20% from £0 spend and 30% over £130 spend. These earnings/orders are every 4 weeks. Use this chart as a planning tool – if you need to get more customers (earn more money) then you can order more catalogues and make a plan to find more customers by increasing your network customer base. The more catalogues you have (and use) the more potential customers and orders you will have. You can also try to increase your average customer spend by perhaps running a promotion or including a newsletter. This will push up your total order value from your existing customers and thus will push up your Oriflame earnings.